Day four of the Winter Olympics featured speeding skiers, flipping snowboarders, stumbling curlers and more. 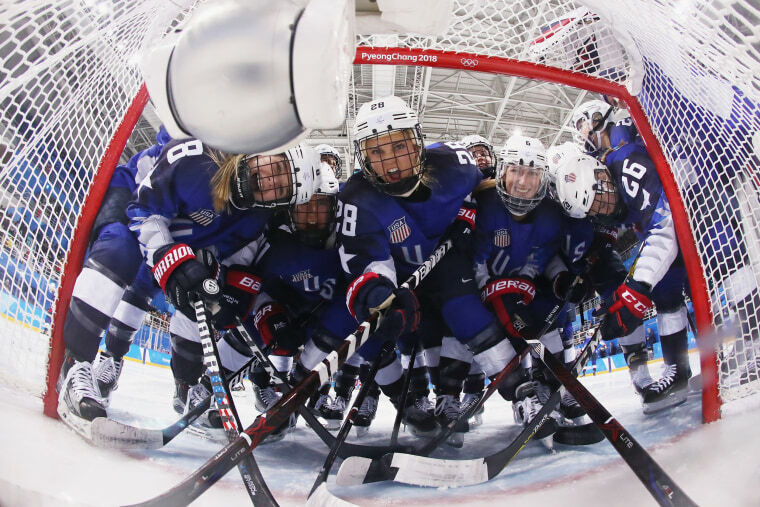 Members of Team USA pose in the goal before the women's preliminary round at the Kwandong Hockey Center on Feb.13, 2018 in Gangneung, South Korea. USA defeated the Olympic Athletes from Russia, 5-0. 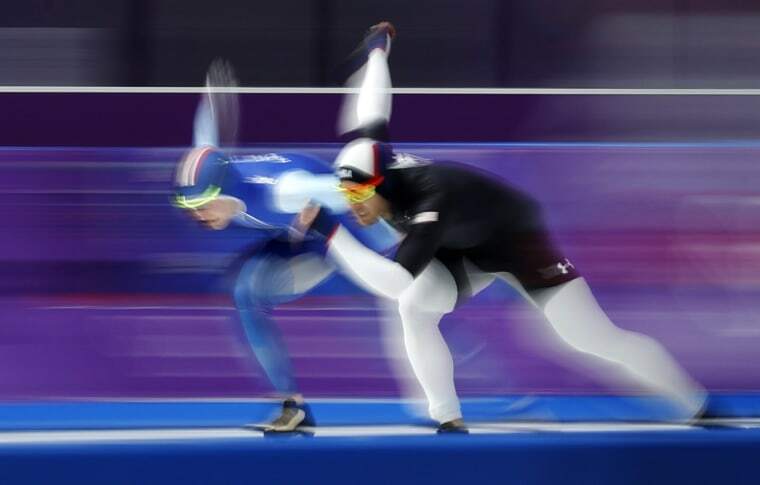 Joey Mantia of the U.S., right, and Norway's Sverre Lunde Pedersen compete during the men's 1,500 meter race at the Gangneung Oval. 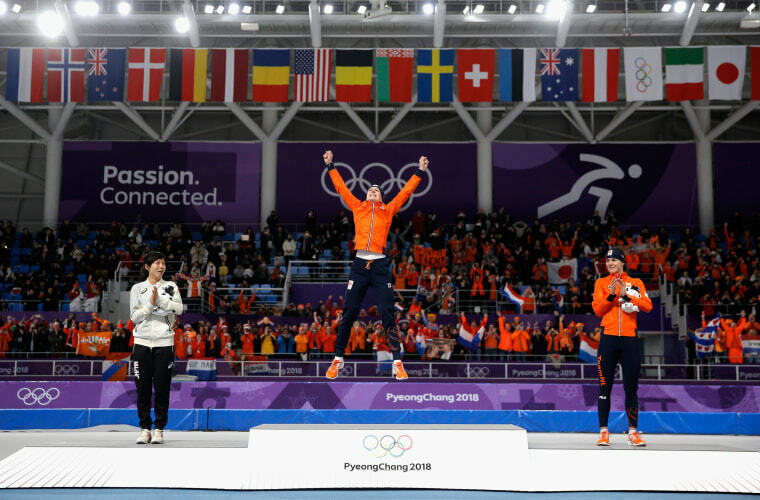 Gold medal winner Ireen Wust of the Netherlands reacts during the victory ceremony as silver medal winner Miho Takagi of Japan, left, and bronze medal winner Marrit Leenstra of the Netherlands look on after the women's 1,500-meter long track final. Germany's Christopher Grotheer practices in the men's skeleton training session at the Olympic Sliding Center. Kristaps Zvejnieks of Latvia makes a run during the men's alpine combined slalom. Chloe Kim of the United States flips during her gold medal winning run at the women's halfpipe finals. France's Baptiste Gros competes during the men's cross-country individual sprint classic qualifications. Gold medalist Chloe Kim celebrates with silver medalist Liu Jiayu of China and bronze medalist Arielle Gold of the U.S. during the victory ceremony after the women's snowboard halfpipe final. Akwasi Frimpong of Ghana prepares for a training run for the men's skeleton. Anastasia Bryzgalova of the Olympic Athletes from Russia falls as she competes against Norway during the curling mixed doubles bronze medal game. Jumpers are reflected in the goggles of Ilkka Herola of Finland during training for the men's nordic combined competition. Jun Ho Kim of South Korea during the men's snowboarding halfpipe qualification run. Lee Kwang-ki, Kweon Lee-jun and Kim Ho-jun of South Korea hug after qualifying for the men's halfpipe final. Shaun White of the U.S. competes in the men's snowboarding halfpipe qualifications. Russia's Pavel Trikhichev lies injured in the snow after a fall during the men's alpine combined downhill. Matthias Mayer of Austria crashes during the slalom portion of the men's alpine combined. 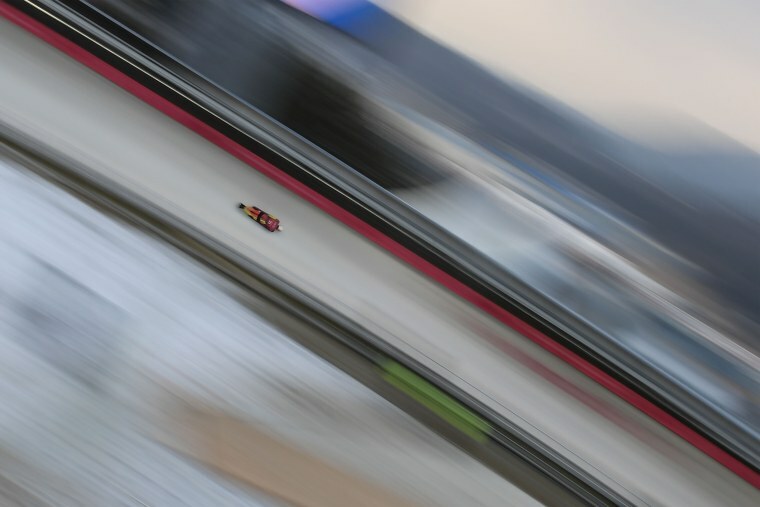 Tomass Dukurs of Latvia takes a turn during a training run for the men's skeleton. Franz-Josef Rehrl of Austria wraps himself in a blanket while waiting to jump during training for the men's nordic combined competition.